Usually if people can find Billiards Pool Cue for their babies or small toddlers these pool cues are either very low quality and not very impressive for shooting with. Players Pool Cues has developed a Baby and toddler pool cue line that is perfect for and small guy or girl to play with. Each one comes with the standard High-End Technology that Players manufactures with. The secret to these small pool cues is that there is nothing manufactured differently from the regular Players Pool Cue line. Each Baby and toddler pool cue is made wit 100% North American Grade “A” wood for maximum handling and straightness. The wood has been turned and dried seven times to insure the high quality of the wood. And each one is properly protected with Nelsonite, and stabilizer that protects the cue from atmospheric change and will keep the wood from expanding and contracting due to heat, cold, and moisture. And the tips on these Baby Toddler cues are the French Le Pro Tips for complete ball control. It is hard to teach a baby or toddler how to play pool but with the correct players cue stick the teaching work load just got cut in half. These cues are made specifically at 30 inches of length and are light weight for a great feel and fit for their little arms and hands. 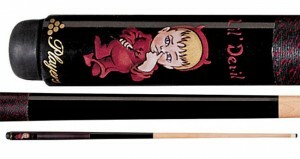 And to finish each Player Baby and Toddler pool cue off the designs are cute and fun for the whole family. Play pool wit a little evil devil cue, May Daddy’s Stick is Bigger than Yours Cue, or the Daddy’s Little Shooter pool cue stick. Extremely cute, inventive, and technically sound. Have your baby’s and toddlers shooting pool like a champ.